I will be travelling to Utah next week (from June 13-25) to witness the Truth to Latter-day Saints. As an itinerant evangelist, I will be preaching/speaking at Grace Family Bible Church in Heber City, Utah, on Sunday, June 17th. I will be preaching at The Narrows Church on Sunday, June 24th, in St. George, Utah. From June 14-16 and 19-23rd I will be in Ephraim and Manti, Utah, reaching Mormons during the Manti pageant as well. From June 17-18, I will be in Salt Lake City witnessing at Temple Square. My answer? Because I love the Mormon people. Since my book has been released in May, I’ve already gotten 2 emails and 1 Twitter message from 3 different Mormons who have said my newly-released book is quote: “anti-Mormon bigotry,” that my book is full of “hatred,” that I “hate the Mormon people,” and that I am “going to hell for writing this book.” I have been in this type of ministry for 4 years now, and I am used to some Mormons spewing out this kind of rhetoric. Bigotry? Hatred? No. The Progressive Left in the United States has gotten pretty cozy calling everyone who disagrees with them “bigots” who are filled with “hateful rhetoric” and so forth. It happens all the time. This comes from so-called “tolerant” Democrats. Why is it that they cry out for anti-discrimination, yet discriminate against those who oppose their views? This vehemently dangerous polemic has its roots in Marxism. The ‘Thought Police’ are at it again. It’s their way of silencing those who oppose them. This is dangerous to do. Many Mormons have bought into this ideology as well, labeling those who disagree with them as “bigots.” Really? It’s time we stop throwing around these pejorative terms and just be okay with disagreement. Disagreement does not equal bigotry. I love Mormons! Why? Because Jesus loves them too. He died for them. I can relate to what Mormons are going through, because I used to believe in Mormonism myself. I used to have a firm testimony that the Book of Mormon was true and that Joseph Smith was a true prophet. Not anymore. Now, I rely solely on Jesus Christ for my salvation, rather than a man-made organization that does not hold true authority at all. Many Christians see what I’m doing and get really excited that I am able to reach Latter-day Saints. However, some ‘casual’ Christians do not understand what I’m doing. The irony is that they simply don’t ask what I’m doing or why I’m doing it. In this day and age, many people just say, “Just leave people alone. They can believe whatever they want to believe. Just mind your own business. ‘Live and let live. '” I’ve heard this from ‘Christians’. If this was true, then we might as well erase Matthew chapter 28 from our Bibles, where Christ tells us to go into all the world and make disciples, preaching the Gospel to the lost. I do what I do out of obedience to Christ. When I get on my deathbed and I look back on my life, I want to be able to be “spent,” meaning, that I’ve squeezed out all I could, knowing that I fulfilled God’s will for my life. Sure, I could quit. I could give up. I could go on and have a “normal” job, a “normal” path to the American dream, just like white suburban parents oftentimes want for their children. But the reality is that in being obedient to what God wants me to do, I am blessed for it. So, will I quit? Stop? No. No, I will not. I cannot. We will find out in eternity all of what the Lord did through us in our lives to affect others, and only eternity will tell. In the meantime, I seek nothing but to preach “Christ and Him crucified,” as the Apostle Paul once said about himself. 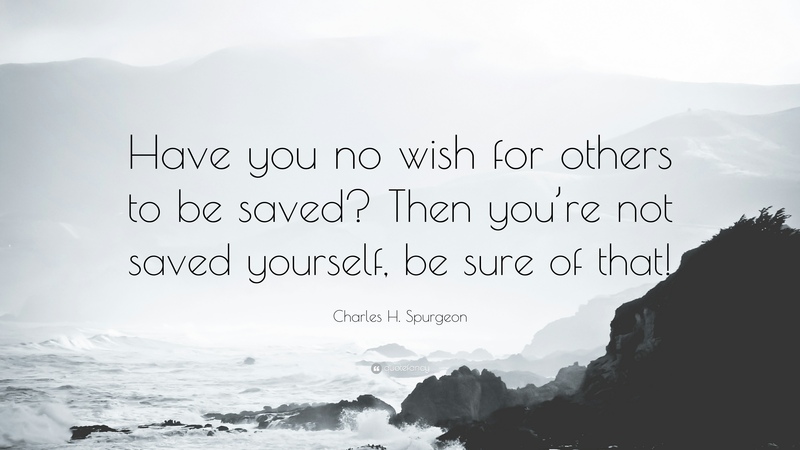 We need a desire to see others saved. If we are Christians, let’s walk the walk, and yes, talk the talk. At some point, we DO need to open our mouths to share the gospel of Christ with others. The Apostle Paul says that a person cannot hear the truth without some preaching to them (see Romans 10:14). If we don’t have that Holy Spirit ‘spark’ in us, that drive to see people hear the Truth, then we’re really not saved. Lukewarm Christianity is not Christianity. Lukewarm (Progressive) Christianity waters down the Word, does away with certain biblical passages, and informs people that Christ is not the only way to the Father. They buy into a soft, watered-down message, that frankly, does not bring forth disciples who are delivered from anything. Progressive Christianity doesn’t see people come to the altar, leave their sins and former lifestyles behind, and become saints who are washed clean by the blood of the Lamb. You just don’t see it. All you see is an incorporation of the current cultural norms (and Leftist propaganda) infiltrating the Church, rather than allowing what the Bible says to infiltrate culture. They have it backwards. The good news is that God always has a remnant of Bible-believing, Holy Spirit-baptized believers here on the earth who will continue to bring forth the flawless Good News of Jesus. Mormons, your church has over 60,000+ missionaries dotting the globe today, trying to reach people with the LDS gospel. Surely, you must then understand the zeal that a Christian has to reach out to you. Only one of us has the Truth. If you were wrong, would you not at least appreciate someone taking the time sending the message of Truth out to you? Mormons, hear this: dozens and dozens of Christians who travel to Utah every June to witness to you often bring their entire families with them. They may leave their families for a week or two. They use their own monetary funds, they use their vacation time from work. They fly in to an airport, and drive hours into the middle of Sanpete County, where the town of Manti is located. Many sleep in sleeping bags in tents in parks and sacrifice vacation pleasures so they will be able to spend their time having conversations with you. They stand in the 90-degree heat for hours in the afternoon and evening having conversations with you. The reason why is because of love, not hatred. Do we disagree with LDS doctrines and theology? Yes, we do. But we love Latter-day Saints because Jesus loves you. I love you, Latter-day Saints. My motive is to be able to let you know that you too can have a personal relationship with Jesus. My motive is to hear your story, your questions, your doubts, what you wrestle with, because it matters. You matter. Know that God loves you and cares for you, and so do I. ← Check Out My Upcoming Speaking and Book Events in Utah This June!